Early on in the 2018 season, I wrote two articles about the importance of short (Circle 1 putting), intermediate (Circle 2 putting and scrambling), and long (fairway hits, etc.) 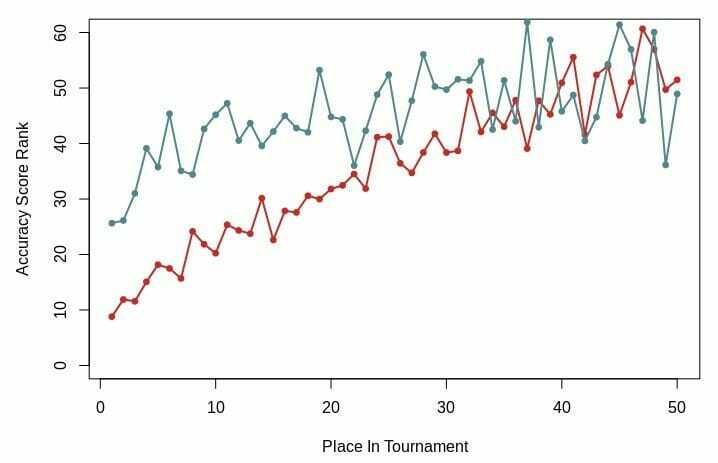 distance accuracies to player success at tournaments. To keep a long story short (pun intended! ), long distance accuracy was by far more important to success than intermediate or short distance accuracy. In the second article, I addressed several concerns with the results, which we will come back to later. However, the only big concern I felt remained after the second article was regarding scope of inference. This is a potentially complicated sounding term. But, in regards to this analysis, it means considering a relatively straightforward question: is long distance accuracy the most important type of accuracy for all tournaments at the courses at the top touring pro level? In my previous articles, I used relatively limited datasets. But for this analysis, I am including Open division players from all 29 tournaments, from 2016 to the present, with data available from UDisc Live.1 In other words, I am maximizing my scope of inference. Additionally, we’ve had an entire summer of tournaments, including some to very wooded courses, like Maple Hill and Idlewild, to add to the analysis. With the setup complete, let’s look at the data. Below is a plot showing the average rank of player’s accuracy scores (long and short) by what place they got in tournaments. A lower rank means better accuracy scores. For example, a player that has a long distance accuracy score of 100 (the maximum value), will have a rank of 1. From the plot, you can see that players that finish first in tournaments rank, on average, about 9th in long distance accuracy. Whereas they rank approximately 26th in short distance accuracy. This dichotomy continues as you move from first place all the way until around 30th place and, again, indicates the supremacy of long distance accuracy in this expanded dataset. Now, let’s return to the concerns we addressed in the previous article. The first one was regarding inflated Circle 1 putting percentages (short distance accuracy) for players that had below average long distance accuracy, or more simply, players with worse long distance accuracy may end up with shorter upshots, shorter Circle 1 putts, and higher Circle 1 putting percentages. However, once again, we see that the data does not support that commonly held theory. 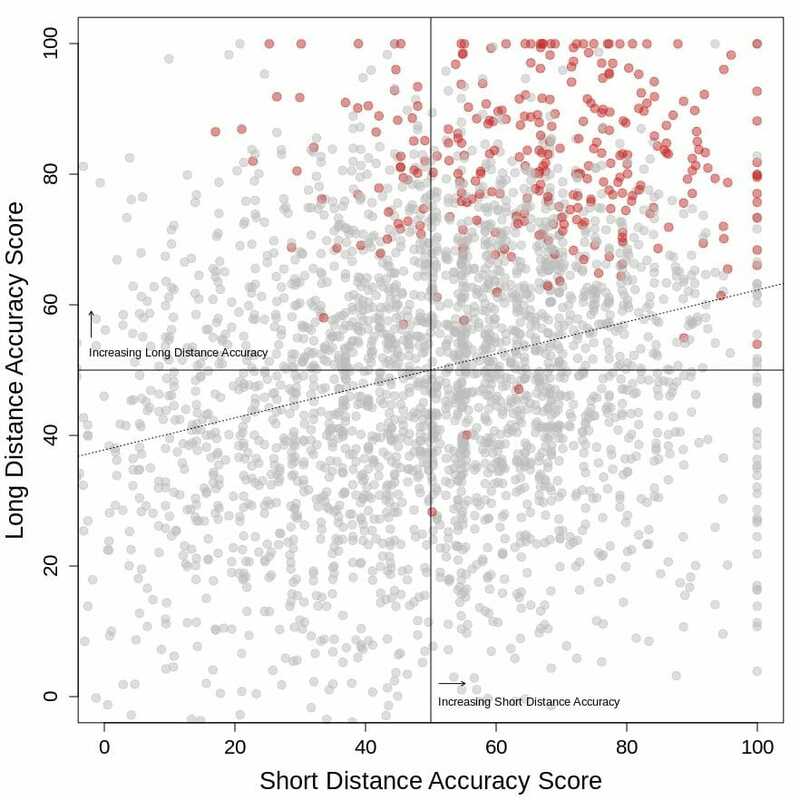 In a plot of short versus long distance accuracy scores we can see that short distance accuracy increases with long distance accuracy2 and the players that finish in the top-10 (red circles) are generally in the top right quadrant. But, there is more left-right spread than top-bottom spread in the red circles indicating that players finishing in the top-10 are, with greater frequency, more likely to have average putting stats, but rarely have below average diving stats. The second concern was regarding course type. Specifically, there was some worry that putting would become more important than long distance accuracy on more heavily wooded courses. This is not the case. 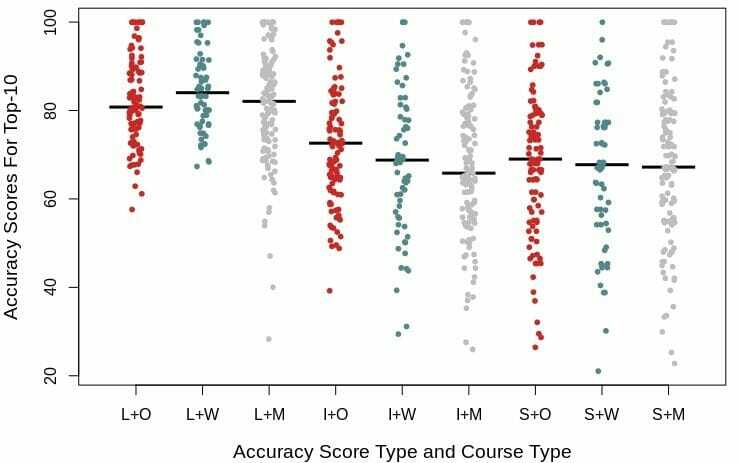 The plot below indicates that whether the course is riddled with trees (wooded), has some trees (mixed), or is relatively free of trees (open), long distance accuracy is much higher than intermediate or short distance accuracy for players in the top-10. Just look at how the black lines for the long distance (the three columns on the left starting with ‘L’) reflect greater values on the y-axis than those for intermediate and short distance accuracy. One needs to look no farther than the performance of MVP Open winner, James Conrad, to illustrate this fact. He ranked 3rd, 3rd, and 4th, in Fairway Hits, and Circle 1 and Circle 2 in Regulation, respectively. However, he was ranked only 40th in Circle 1 putting. Those equate to long distance and short distance accuracy scores of 88 and 70.3 Conversely, the highest finishing player that was perfect from Circle 1 for the event was Steve Brinster, who finished in a tie for 18th, which is pretty good, but not 1st place — and in this case 14 strokes out of first place. The primacy of long distance accuracy seems to hold for all course types, including the wooded courses that are part of the upcoming Pro World Championship in Vermont. 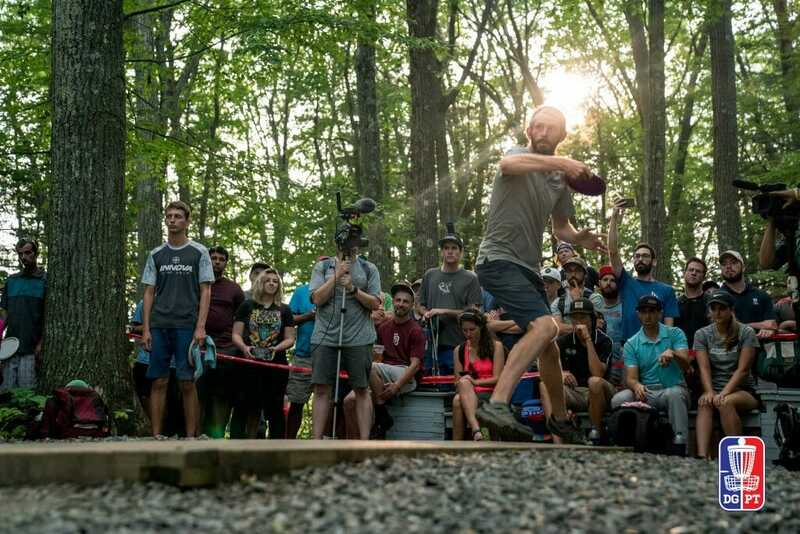 The two previous winners of the Green Mountain Championship, which were held on the same courses as Pro Worlds will be, were both ranked 2nd in the field in long distance accuracy. So get out there everyone, hit fairways, land greens in regulation and there’s your recipe for winning a World Championship. Comments on "Flight Numbers: Drive For Dough And Putt For Show, Revisited"